Hunter Holloway and Donnalaris. Photo Credit ©Sportfot. 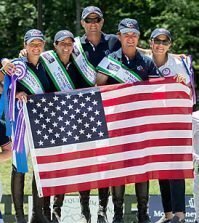 Mill Spring, NC – June 4, 2017 – Hunter Holloway of Topeka, KS and Donnalaris captured the win in the $20,000 Hollow Creek Under 25 Jumper Classic at Tryon International Equestrian Center (TIEC) to conclude a successful first week of competition to start the 2017 Tryon Summer Series. Holloway and Donnalaris secured the victory with a jump-off time of 28.2 seconds. Emanuel Andrade of Wellington, FL and Clouwni took second place after stopping the timers in 29.497 seconds ahead of Brittni Raflowtiz of Palm City, FL and Hope Van’t Zorgvliet, who finished the jump-off track in 30.024 seconds. Holloway had a busy afternoon with four rides in the class, besting seventeen combinations to rise to the top of the leaderboard with Donnalaris. Eight entries moved forward to contest the short course, while Holloway also guided I Love Lucy into the top five finishers of the class, earning two fantastic placings on the afternoon. 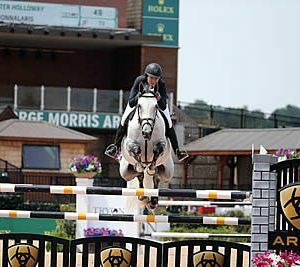 Donnalaris, a 2008 Dutch Warmblood mare owned by Virginia Bartholomay, is a young, talented mount and Holloway is eager to continue working on their partnership together, as she is anticipating success with the striking grey mare. The duo topped a competitive class in the George H. Morris Arena and Holloway was pleased with the duo’s performance. “She is owned by Virginia Bartholomay. Diane Carney helped find her and produce her, and I got the ride at the end of the Florida circuit,” explained Holloway. “We’ve just been growing as a pair and I’m very excited about what the future holds with her. “She’s a pretty quick horse in general. She’s quick across the ground and over the jumps, so I think today I was able to be smooth everywhere and chew off some time. She’s an amazing horse and doesn’t really have any gaps or anything, so it was exciting to be able to go out there and give it our all,” she added. 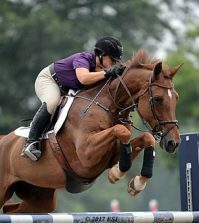 The $10,000 High Junior Amateur/Owner Jumper Classic was championed by Andrea Torres Guerreiro of Waterford, VA and Evermine, owned by Santa Catalina Farm, with a jump-off time of 27.131 seconds. Kaely Tomeu of Wellington, FL and Contenance 15, owned by Siboney Ranch, collected second place with a time of 29.612 seconds. Ali Boone of Lexington, KY and Like A Dream, owned by Sterling Equestrian, followed in third with a time of 29.893 seconds. 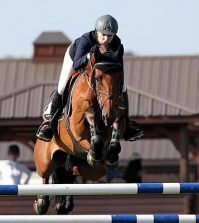 Alexandra Welles of Wellington, FL and her own XM earned top honors in the $5,000 Medium Junior/Amateur Owner Classic after completing the jump-off track in 27.21 seconds. Lily Hahn of Columbus, NC and her own Karenina secured second place with a time of 27.656 seconds. Rafael Contreras of Wellington, FL and his own Florence A rounded out the top three placings with a time of 28.053 seconds. The $3,000 Low Junior/Amateur Owner Classic saw Victoria Zelch and Sniper, owned by Musical Woods, LLC, rise to the top of the class, as the pair completed their jump-off round in 33.006 seconds. Catie Boone of Lexington, KY and Akatschino, owned by Sterling Equestrian, finished in second place with a time of 29.521 seconds, adding four faults to their score. Ashley Pace of Aiken, SC and her own ZZ-Top VH Schaarbroek Z finished in third with a time of 31.882 seconds, also adding four faults to their final trip around the track. Deborah Perkins of Wellington, FL and her own Chivu rode to victory in the $2,000 NAL/WIHS High Children/Adult Classic after completing the jump-off in 30.951 seconds. Maggie McCormack of Wellington, FL and Capall Zidane, owned by Marker’s Make LLC, finished in second place with a time of 32.066 seconds ahead of Stephanie King of St. Augustine, FL and her own Co-Starr, who rounded out the top three finishers with a time of 32.671 seconds. The Amateur Owner Hunter 3’3″/3’6″ Division saw Tracy Treace of Ponte Vedra Beach, FL and her own King rise to collect champion honors ahead of Caroline Faith Kornegay of Raleigh, NC and her own Adoration, who followed in reserve. The Children’s Hunter Horse 14 & Under was championed by Marshall Broadfoot of Charlotte, NC and As You Wish, owned by Haley Rogers, while Josie Evans of Covington, GA and Mandolin, owned by Lynn Laird, were presented with reserve champion. Elizabeth Smith of Spartanburg, SC and her own Double Gold performed consistently throughout the week to take top divisional honors. Raine Whitman of Monroe, NY and her own Rollingwood’s Give ‘EM L took reserve champion. The Platinum Performance 3’3″/3’6″ Performance Hunter Division saw Christina Kelly of Aiken, SC and her own BeforeAnythingElse ride to top divisional honors ahead of Caroline Willard of Oak Ridge, NC and Sky Pilot, owned by Alex Stevens, who were presented with reserve champion. 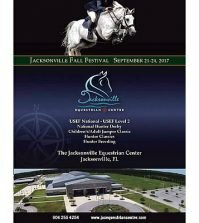 The USHJA Hunter 2’6/2’9/3’ Division was championed by Ashley Conkle of Wellford, SC and Hidden Lane, owned by Page Tredennick, take home the tri-color ribbon, while Deborah Perkins of Wellington, FL and her own Rise and Shine finished in reserve. Jessica West of Charlotte, NC and her own Life In Color finished atop the Junior Hunter 3’6″ Division after a week of strong performances. Lindsey Rigney of Waxhaw, NC and her own Calypso took home reserve champion. The Junior Hunter 3’3″ Division was championed by Beverly Davis of Harrisburg, NC and her own Alchemist, who took home the tri-color ribbon ahead of Caitlin Hooper of Canton, GA and her own Why Not, as the pair finished in reserve. Davis and Alchemist also took home top honors in the $1,000 Junior/Amateur Owner Hunter Classic 3’3″/3’6″ with a two round score of 159.